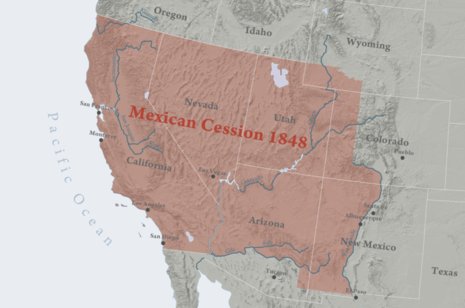 The Mexican Cession of 1848 is a historical name for the region of the present day southwestern United States that was ceded to the U.S. by Mexico in 1848 under the Treaty of Guadalupe Hidalgo which ended the Mexican-American War. The treaty was signed on February 2, 1848, ratified by the U.S. Senate on March 10, 1848, and by the Mexican government on May 19, 1848. # Mexican Cession lands were a product of the Mexican-American War and the subsequent Treaty of Guadalupe Hidalgo, signed February 2, 1848. 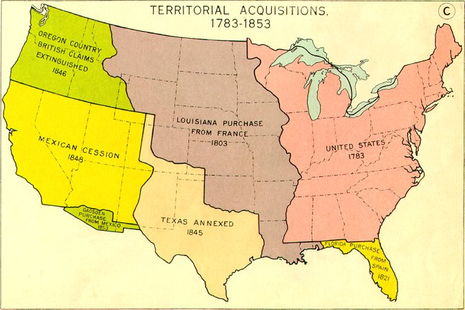 In this treaty, Mexico gave the U.S. parts of what is Texas, Colorado, Arizona, New Mexico and Wyoming, and the whole of California, Nevada and Utah and recognized the Rio Grande as Texas' Southern border. The United States paid Mexico $15 million. In addition, the United States agreed to pay claims made by American citizens against Mexico, which amounted to more than $3 million.